Dell’s Inspiron range has produced some fantastic consumer laptops of late, from compact netbooks to big-screen home media centres. The Inspiron M301z is a sleek ultraportable and, while it lacks power, it ably compensates with portable style. Finished in plastic, the slim chassis uses a mock brushed-aluminium finish for a surprisingly luxurious look at this low price. While we found it very well built throughout, the glossy finish is inevitably prone to scratches and fingerprints, and not quite as resilient as we’d have liked. Weighing 1.8kg and with a depth of just 25mm, this is a laptop built for life on the move and ideal for use around the home, with the 284-minute battery being pleasing, if a little unexceptional. While the full-sized keyboard provides strong usability, it is not without its flaws. The board is impressively wide and its large keys allow comfortable use. We did find the keys quite spongy, however. The 13.3-inch Super-TFT screen is stunning and, while not quite as bright as we’d hoped, image quality is fantastic. Photos and text are rendered with impressive sharpness and contrast. Colour reproduction is a little flat though, with colours not always shown accurately. Inevitably for a laptop this slim and affordable, performance is strictly midrange. The dual-core AMD processor provides ample power for family and home office use, but don’t expect the same level of performance you would get from a similarly priced Intel Core-based machine. Graphics are equally mid-range, but the ATi graphics card delivers more than enough power for watching high-definition videos, as well as basic photo and video editing. Both HDMI and DisplayPort connections are also in place for connecting to a larger screen or projector. 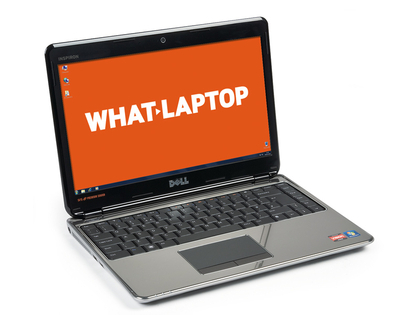 Where the Dell stands out is its comprehensive storage for such a small machine. The 500GB hard drive will not be quickly filled and the 7-in-1 card reader provides broad support for the most popular flash storage cards. Predictably for such a slim machine, there is no DVD drive. Dell has, however, squeezed a good array of ports in, including three USB ports, with one doubling as a high-speed eSATA port. When you consider the Apple MacBook Air costs Â£770 more and has just two USB ports alone, the value of this machine becomes apparent. That’s the real strength of this laptop. While machines like the MacBook Air and Sony’s VAIO Z-Series represent the vanguard of stylish mobile computing, their price often puts them out of reach, so laptops like the Inspiron 301z bring stylish mobility to the rest of us.